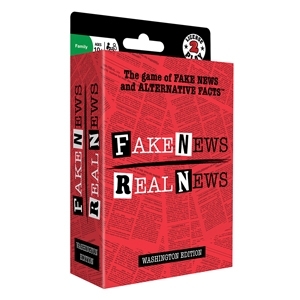 Fake News / Real News is the fast-paced card game where players have to decide what’s Fake News and what’s Real News. 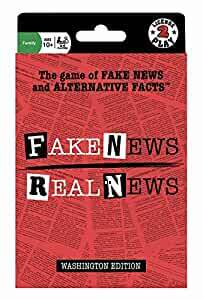 This fast-paced, hilarious and sometimes outrageous card game taps into today’s political dialogue, both real and fake, in a fun and socially engaging way where people of all political stripes can interact and have a good time together. We’ve assembled hundreds of real newsworthy quotes from last year’s presidential campaign and the first few weeks of the new administration along with fake news quotes that are entirely fabricated. Can you tell the difference? It’s not as easy as it sounds. 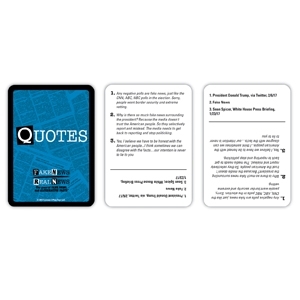 100 Quote Cards with 300 Quotes. 42 Character Cards (6 sets of 7 Caricature Cards of Adminstration Members). 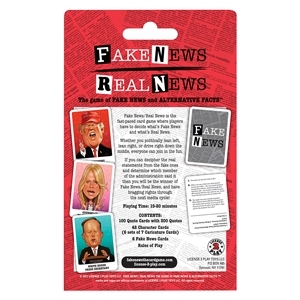 6 Fake News Cards. 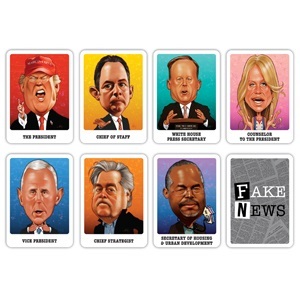 Each player is dealt cabinet members and a Fake News card. Players take turns reading statements from Quote Cards and other players determine if the quote is real or fake and, if real, who said it. You either play your Fake News card (if you think the quote is bogus) or the Cabinet Member card of the person you believe said it. Get it right and score a point. First to 11 points wins! Whether you politically lean left, lean right, or drive right down the middle, everyone can join in the fun. 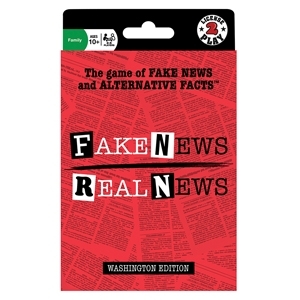 We’re a couple of news junkies and avid game players who were inspired by the recent election and ongoing dialogue out of Washington to come up with a great topical game that’s fun play. It will be the first non-partisan game to market that is topical and timely. Fake News/Real News celebrates the words and quotes of the 2016 presidential election cylce and current administration. The overwhelmingly enthusiastic and positive reaction we’ve received from everyone we’ve shared it with regardless of their political affiliation. If you are a seller for this product, would you like to suggest updates to the product page?